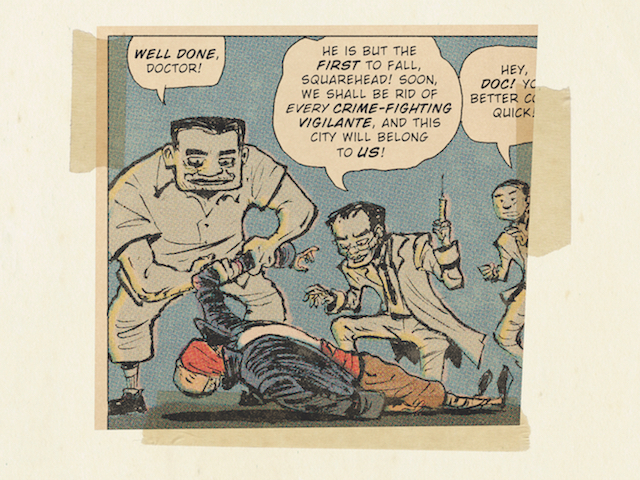 In The Art of Charlie Chan Hock Chye readers are transported to moments in Singapore's history—including the arrest and detention of leftwing politician and union leader Lim Chin Siong, illustrated here. “Poetry is a luxury we cannot afford,” Singapore’s first prime minister Lee Kuan Yew famously remarked to students at the National University of Singapore in 1968. What students needed instead, he elaborated years later, was “a philosophy of life… a value system.” These values—the emphases on hard work and pragmatism, along with tolerance and a strong belief in meritocracy—were promoted by the government as key to the survival of the tiny Southeast Asian city-state, particularly during its vulnerable years after achieving independence in 1965. Last year, the country celebrated its 50th birthday with a lavish yearlong celebration. While 50 years may seem minuscule in comparison with other nations, Singapore has in that short time earned a global reputation for its high standards of living, robust system of national education, corruption-free government, clean streets, and largely peaceful multicultural society, while also drawing attention for the ruling People’s Action Party’s brand of “benevolent authoritarianism,” caning laws, and restriction of civil liberties such as freedom of expression and assembly. Much has been made of Singaporean exceptionalism, and one of our oft-repeated national narratives is that the late revered Lee Kuan Yew and his technocratic People’s Action Party transformed Singapore from a sleepy third world outpost or “fishing village” into the Switzerland of the East, a global city on par with London or New York; and without constant vigilance, it could just as easily slip back into the malarial jungle it once was. In some versions of this story, the restrictions on citizens’ civil liberties were—and continue to be—justified in the name of progress, even survival. But the Official Singapore Story is coming under increasing threat—from independent Singaporean historians, filmmakers, and writers, as well as former opposition party members who have begun to speak out, offering alternative versions of the country’s history. 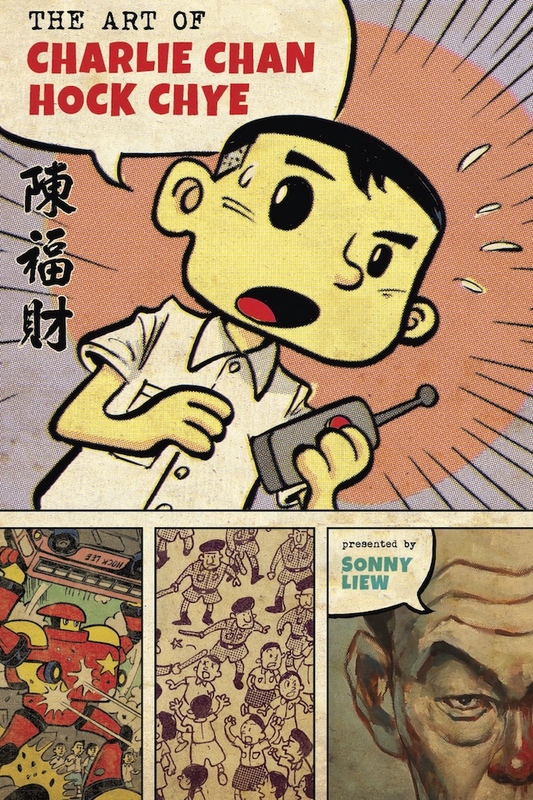 The Art of Charlie Chan Hock Chye by Sonny Liew. 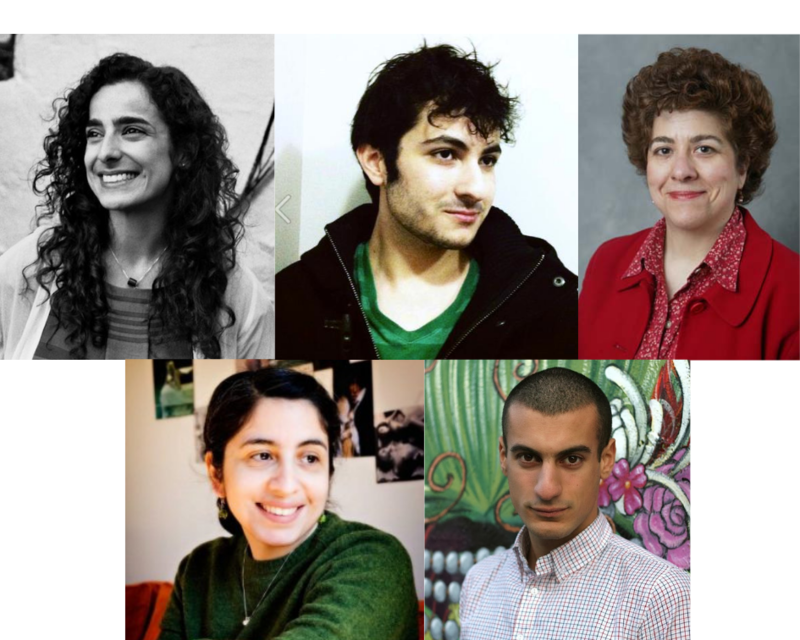 Pantheon Books, 2016. One of them is artist Sonny Liew, whose powerful graphic novel The Art of Charlie Chan Hock Chye was published earlier this year in the U.S. by Pantheon Books. Already many Singaporean writers’ and academics’ favorite book of 2015, it has been hailed by American critics as a brilliant work of art, drawing comparisons to Art Spiegelman’s Maus and Marjane Satrapi’s Persepolis, and is certainly the most important graphic novel to emerge from Singapore so far. The book is the biography of fictional comic book artist Charlie Chan, whose career spans the five decades from Singapore’s tumultuous birth as a nation to the present day. By way of Chan’s politically engaged, often satirical cartoons, readers are transported through key moments in the country’s history, many of which remain disputed in the historical narrative: the standoff between the Singapore Bus Workers’ Union and the Hock Lee Bus Company that ended in violence and in the enactment of the predecessor to today’s Internal Security Act; the rise of Lee Kuan Yew and his People’s Action Party; and the trial without detention under the Internal Security Act of opposition politicians such as trade union leader and People’s Action Party co-founder Lim Chin Siong. All this is illustrated in a dazzling variety of styles that mirrors the development of the comic book medium itself, paying homage to everyone from Japanese manga artist Osamu Tezuka to Mad magazine and British comic The Beano. 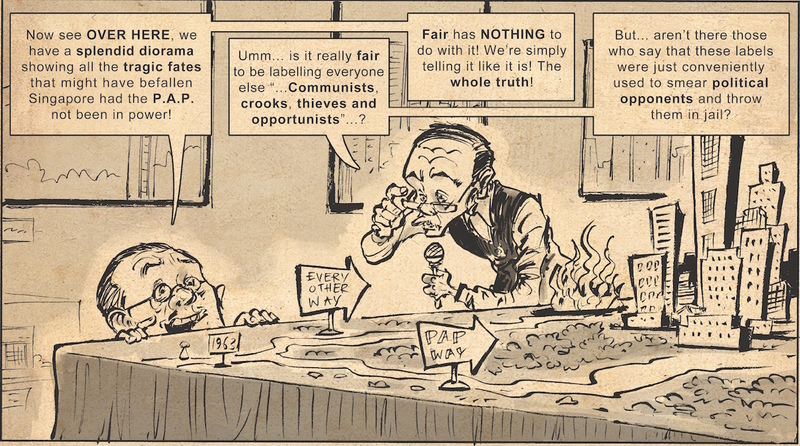 Inspired by the style of Mad magazine, this panel from the fictional cartoonist Charlie Chan’s “Singapore Story” pokes holes in Singapore’s state-sanctioned history. Chan’s comics are too politically radical to be true, however, and would never have made it past the powers that be. One of the most subversive is a re-telling of Singapore’s history in which charismatic opposition politician Lim Chin Siong—and not Lee Kuan Yew—wins the 1963 election to become the country’s first prime minister, while Lee Kuan Yew flees to Cambodia in exile. Lim is portrayed in a television interview espousing views that are strikingly similar to the real-life Lee’s. Under Lim’s leadership, Singapore is depicted transforming into the modern, skyscraper-filled nation it is today, in contrast to the popular belief that the Communist-sympathizing Lim and his left-leaning Barisan Sosialis party (or the Socialist Front) would have run Singapore into the ground if they had gained power. In reality, Lim was detained without trial by Lee’s government under the Internal Security Act. After six years of imprisonment, Lim went into exile in London, a relatively forgotten figure in his country’s history when he passed away in 1996. To this day, the question of whether Lim had links to the Malayan Communist Party remains a central debate in the scripting of Singapore’s modern historical narrative. As part of an imagined history of Singapore in which Lim Chin Siong wins the 1963 elections instead of Lee Kuan Yew, Lim responds to a TV interview. 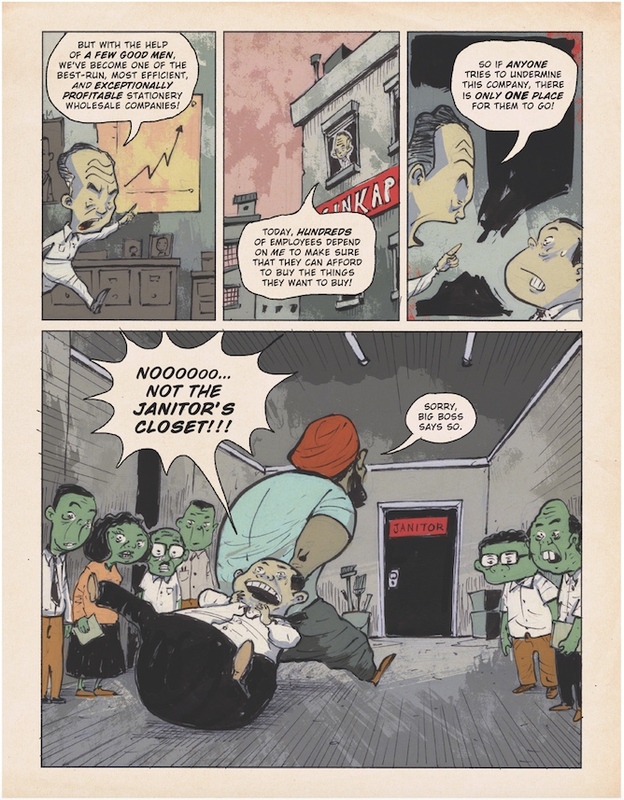 In another particularly devilish comic, Lee Kuan Yew (whose English name was Harry Lee) is caricatured as Mr. Hairily, the scheming boss of the stationery company Sinkapor Inks (a play on Singapore Inc.), who locks the company’s newsletter writer in the janitor’s closet for criticizing the management—a reference to the government’s tight rein on the media. Lee also hysterically accuses several hapless employees of trying to convert their colleagues into fans of singer Richard Marx—a thinly veiled allusion to Operation Spectrum, in which 22 activists with suspected Marxist links were detained without trial under the Internal Security Act in 1987. In a similar move, the National Arts Council (NAC) withdrew the $8,000 publishing grant it had originally awarded The Art of Charlie Chan Hock Chye, shortly after the book was published in May 2015 by Singaporean independent publisher Epigram Books (where I used to work). The NAC cited “sensitive content” and that “the retelling of Singapore’s history in the work potentially undermines the authority or legitimacy of the government and its public institutions.” Since then, both the graphic novel and documentary have become touchstones in a growing debate about censorship in Singapore. 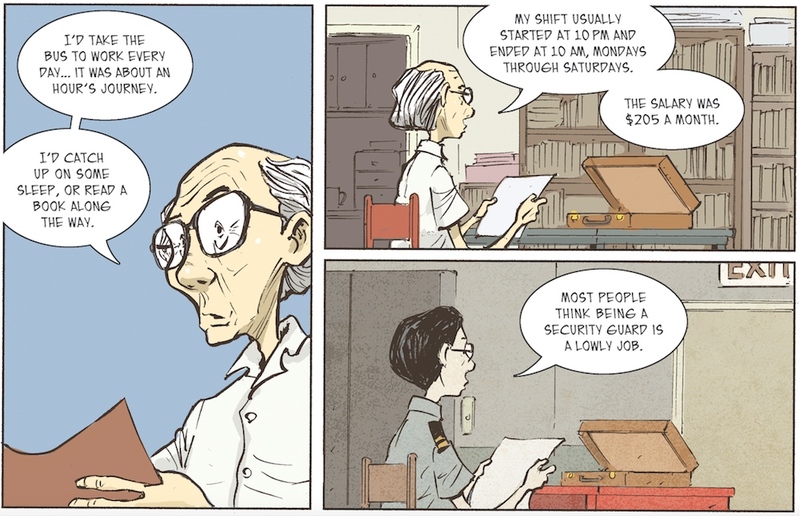 In this comic, Lee Kuan Yew is caricatured as the authoritarian boss of a stationery store who disciplines an employee for criticizing management. The government’s control over artistic expression is especially ironic given its current embrace of the arts, an exceedingly pragmatic move underpinned by economic and political motives. As part of its Renaissance City Plan laid out more than 15 years ago, the government has been pumping money into museums, festivals, prizes, and arts schools, with the goal of transforming the country into a global arts city. Recognizing the tourism dollars and economic gains to be had, the government hopes to create new jobs and satisfy a growing regional demand for art. In 2015, the National Gallery, which boasts the largest collection of public art in Southeast Asia and cost the state around $390 million, opened to great fanfare on the commanding site of the former Supreme Court. Another stated purpose of the Renaissance City Plan is to “strengthen national identity and belonging among Singaporeans by nurturing an appreciation of shared heritage.” A polyglot nation of immigrants from China, India, Malaysia, and other parts of the world, Singapore lacked both an ethnic majority base and a shared value system when it split from the Federation of Malaya in 1965 and became independent. 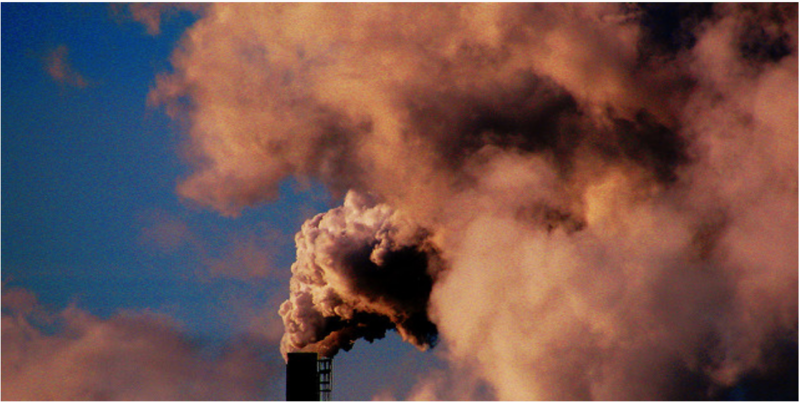 A nation had to be created artificially, and along with it, a national narrative. The People’s Action Party’s mandate to rule has in part been upheld through a version of history that has justified its actions and explained its record to the electorate, including the detainment of political opponents without trial. Most citizens remain quite uneducated about, even uninterested in, events that have taken place in their country’s past—a result of the PAP restricting access to historical archives and implementing its National Education Programme that ensures all Singaporean students, from elementary school onward, are taught the state-sanctioned Singapore Story. And historians proposing a different version of past events have repeatedly been discredited by the establishment and been dubbed “revisionist historians” and “intellectually dishonest” by Minister of State Sam Tan. But there are encouraging signs that Singaporeans are getting tired of being told who they should be and what they should think. A week after the ban on To Singapore with Love was announced, hundreds of Singaporeans crossed the narrow Strait of Johor on buses to watch the film in neighboring Malaysia. Similarly, the withdrawal of the grant for The Art of Charlie Chan Hock Chye gave the book a massive boost in publicity. The first print run of one thousand copies sold out within a week in a country where publishers can struggle to sell a few hundred copies of a local book. To date, the book has sold around ten thousand copies in Singapore. On occasion, Sonny Liew appears in the bottom margin of the page with his own commentary on Charlie Chan’s work. One of the strengths of The Art of Charlie Chan Hock Chye is that it self-consciously draws attention to the artifice of its own narrative. Each of Chan’s comics is framed with extensive notes and commentary, setting the context for the historical events depicted. 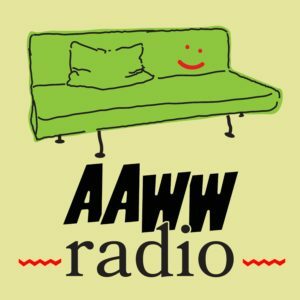 Sonny Liew himself regularly appears as a bespectacled character in the margins of the book—explaining some of the more nuanced back-story behind a comic strip, sometimes with visible passion and frustration. Detailed endnotes provide further elaboration and sources for readers who are interested to learn more. The book doesn’t provide a one-sided account either. It acknowledges the gains that the country has made under Lee Kuan Yew’s leadership, while examining the costs that relentless progress has exacted on its citizens. 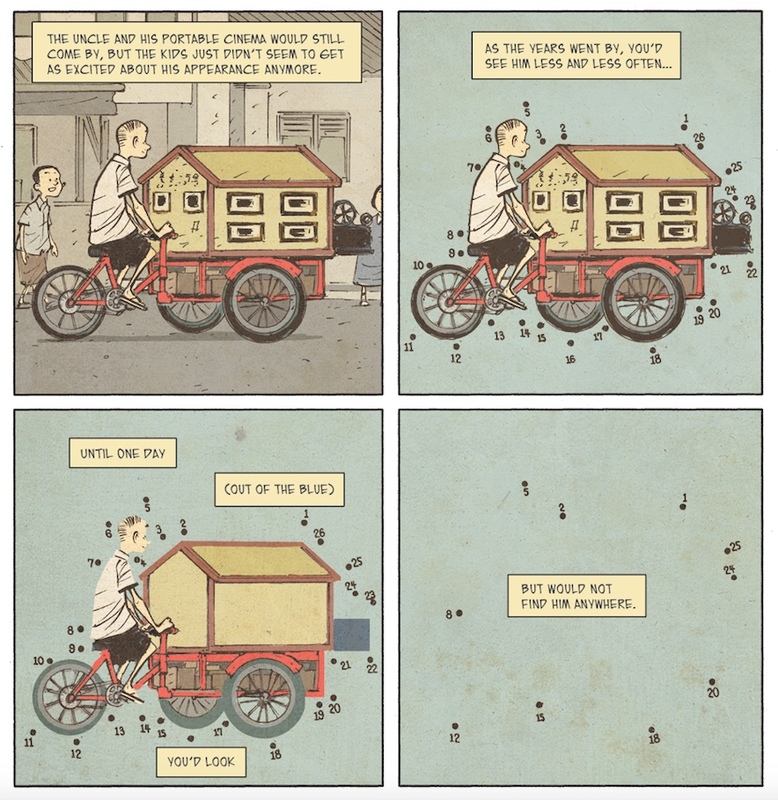 In a poignant series of panels, we see a vestige from the past, a man biking with his portable cinema, disappear from panel to panel, eventually leaving behind nothing but a few connect-the-dots. Chan’s life choices can be read as a rejection of Lee Kuan Yew’s unyielding pragmatism—the equally uncompromising artist choosing art for art’s sake over material and financial security. It’s perhaps in this respect that Chan least resembles real-life Singaporean artists, many of whom survive on monetary support from the National Arts Council (myself included)—the very funding body that withdrew its support from The Art of Charlie Chan Hock Chye. By remaining untethered to the state, Chan’s independence can be read as a political act. As an older man, Charlie Chan looks back at how he funded his passion for drawing—by working as a security guard. The most poignant scene in one of Chan’s comics comes when he, through a process of time travel, has a glimpse of his own future as a struggling artist living in obscurity. Yet when faced with the choice to change his path in life, Chan chooses to pursue the same vocation in spite of all that he knows. “For now, let me dream, of all the comics I have yet to draw… The life I have yet to live…,” he thinks, “And of my country, which is yet to be.” Perhaps this is Chan’s reminder to all Singaporeans that the ink of history is never dry—that the nation always requires an act of imagination, but also one of daring re-imagination. Wei-Ling Woo is a writer and editor from Singapore. She has worked as an editor at the Singaporean independent publisher Epigram Books, and more recently on the Communications & Editorial team at PEN America.